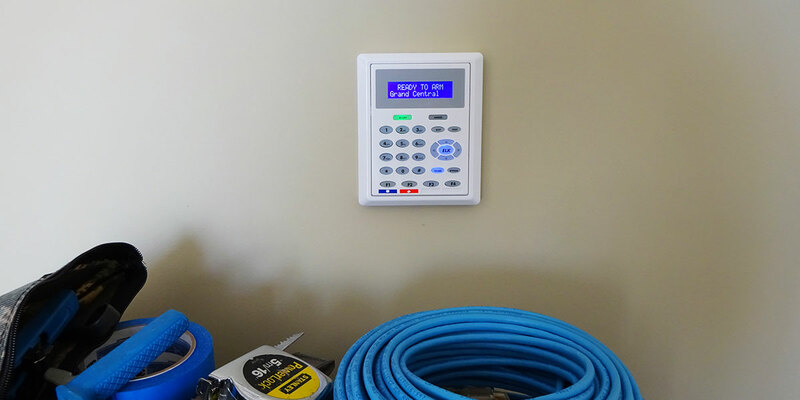 Image taken by Grand Central Wiring after the installation of a wireless home security system. We sell and install home security systems in the Greenville, SC area. Our alarm systems have smart home capability plus integration of video surveillance cameras. Our systems can be set up as wired or wireless. The alarm systems we install can be set up with or without a monitoring service. When the system detects an intruder/fire, the siren sounds immediately and calls/texts/emails up to 10 different people. A lot of people didn’t know that Greenville now offers a free text to 911 service. When we set up your new alarm system, we can program it to call/text 911 and give detailed information about where to dispatch fire or police. Also, the system can notify you, your spouse, kids neighbors, anyone with a telephone or internet connection. Over 2 million homes are broken into every year, sometimes even while people are home. Police data shows that homes having security systems experience fewer break-ins. And we have personally interviewed police that tell us that having a home alarm system does deter and reduce the chances of a break-in. Burglars usually leave when they discover you have an alarm system, because the last thing they want is for sirens to call attention to what they’re doing. And they’re not going to stick around to see when the police arrive. Let Grand Central Wiring professionally install your home security system. Call (864) 881-1675 to talk with us about your project.